You see that picture right there? Take a good look at it. 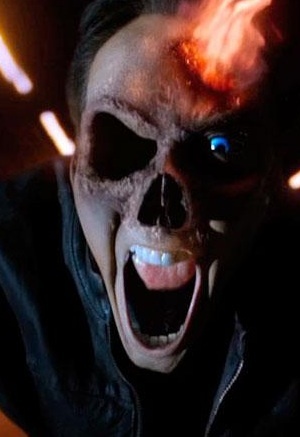 Would you believe me if I said that Nicolas Cage’s non-CGI scenes were WAY more insane than that? Don’t believe me? I went to see Ghost Rider: Spirit Of Vengeance in 3D for one reason and one reason only. That reason was that this potential franchise was now in hands of Mark Neveldine and Brian Taylor. For those of you not familiar with the Neveldine/Taylor brand, allow me to point you to the Crank series of films which are probably the most intense and underrated action films I’ve ever seen. This duo pushed the envelop and so hard to the point where the sequel Crank: High Voltage could be classified as an art house action film. I loved the thought an insane movie like Crank being centered around a superhero and to an extent, the movie delivers on that. There are some seriously intense moments in this flick and quite a few surprises too good to spoil for you guys. Unfortunately, those moments do not have a substantial narrative to string them together. In a nutshell, the film’s story is flimsy to the point where as I write this review, I have to use some serious brain power to recall anything that happened in between those moments. While the supporting cast, including an underdeveloped, underused, yet somehow still memorable Idris Elba, do their jobs fair enough, Nicolas Cage knocks this role out of the park. Cage is certifiable as Johnny Storm and it’s a pretty satisfying experience. There are numerous scenes where Cage chews the scenery just enough to cause some serious laughs. My only gripe is that the Neveldine/Taylor magic was not as prevalent as I would have liked. The scenes where they just let their creativity soar were the highlights and if they had just let loose, who knows what insane, yet adolescent appropriate, set pieces I could have been writing about. Ghost Rider Spirit of Vengeance 3D, at it’s core, is a fun movie that goes by just fast enough for you to only remember the good times. I recommend the movie for those looking for a jolt this weekend.